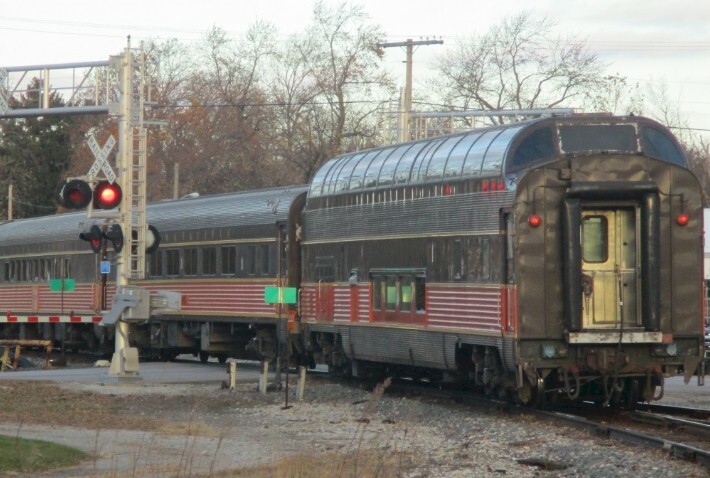 Since June 2016, the American Passenger Rail Heritage Foundation's Rail Rangers program has been working hand-in-hand with the Indiana Department of Transportation and Iowa Pacific Railroad to develop an onboard educational program on the Hoosier State train between Lafayette, Indiana and Chicago, Illinois. After several months of research, we formally launched our onboard efforts with a group of ten volunteers in November 2016. In just the past few months time, the program has become a popular feature for passengers on select Sunday morning departures. We have had several dozen people come up to us and say they're riding just because of the Rail Rangers! That's a pretty cool feeling. Since launching two years ago, the Rail Rangers has provided narration and route guides almost exclusively on private rail excursions. However, when Mr. Ed Ellis, the President of Iowa Pacific asked us last summer to come up with a program for the Hoosier State train, we eagerly took up the challenge to be back on a regular public route. Some of our recent TrainWeb articles have focus on the historic railcars used on the train (December 1, 2016 article) and about how we developed our interpretive programs for this train line (October 31, 2016 article). Unfortunately, on January 30, 2017, it was announced that Iowa Pacific would no longer be the operator of the onboard services and equipment on the Hoosier State, effective March 1, 2017. The former Santa Fe full-length Big Dome and the historic coaches are scheduled to be replaced once again by the standard Amfleet and Horizon equipment. Meanwhile, with Iowa Pacific out of the equation, the future of the APRHF Rail Rangers Riding the Hoosier Rails program hangs in the balance. We are expected to hear back from INDOT and Amtrak in the coming weeks as to if we will be able to continue doing our programs past March 1, 2017, and on what terms. While we patiently wait for an answer on the future of our program in Indiana... we figured this would be the perfect time to point out some of the interesting sites you can see from the train between Lafayette and Rensselaer. This is written as if you are going northbound on Train #851. About seven miles north of Lafayette, the Hoosier State will pass one of the most important historical sites that can be seen from the train – Prophetstown State Park and the Tippecanoe Battlefield Site. Let’s go back to the year 1808, when a Native American village was established along the banks of the Wabash and Tippecanoe Rivers. Portions of it were located in the area that you see today on the left side of the train; it was called Prophetstown. Tecumseh came to this area, with the band of Shawnee that he led, after all were forced out of their homelands in Ohio by white settlers. At the time, the United States was a new country, and many Americans were looking to live in new territories west of the Appalachian Mountains. However, as you can imagine, Native Americans did not like their ancestral areas being taken over in such a way and did not understand the idea that someone could actually own a piece of land. Tecumseh decided that the only way Native Americans could survive and continue to live in their homelands would be to form an alliance with other tribes. He traveled persuading tribes to join his coalition. More than 14 tribes set aside their century-old disputes to stop their new common enemy. They come together in what became Prophetstown to seek the wisdom of Tecumseh’s brother – a Shawnee religious and political leader known as the Prophet. The Native Americans hoped the sheer size of their settlement would stop westward expansion. Instead of putting a halt to westward expansion, what was occurring at Prophetstown angered white settlers and the government. Many were especially alarmed when the Prophet’s message grew more militant and the training of warriors began to take place here. In November 1811, then-governor of Indiana Territory, William Henry Harrison, moved around 1,200 troops to near Prophetstown. He was there to meet with tribal leaders and make them aware of federal demands that Natives stop attacking white settlers in the Ohio Valley. Tecumseh was away from the village upon Harrison’s arrival on November 6, 1811. He and the soldiers decided to camp out overnight near the site, awaiting a meeting the following morning with the Prophet. It is reported that some Natives in the village grew restless that such a large number of soldiers were camped so close, and feared an imminent attack. In the middle of the night, the Prophet awoke and told his villagers that he had a vision that sending a party of warriors to murder Harrison in his tent was the best way to avoid battle. Although the outnumbered attackers took Harrison’s army by surprise, Harrison and his men stood their ground for more than two hours. The Natives were ultimately repulsed when their supplies and ammunition began to run low. 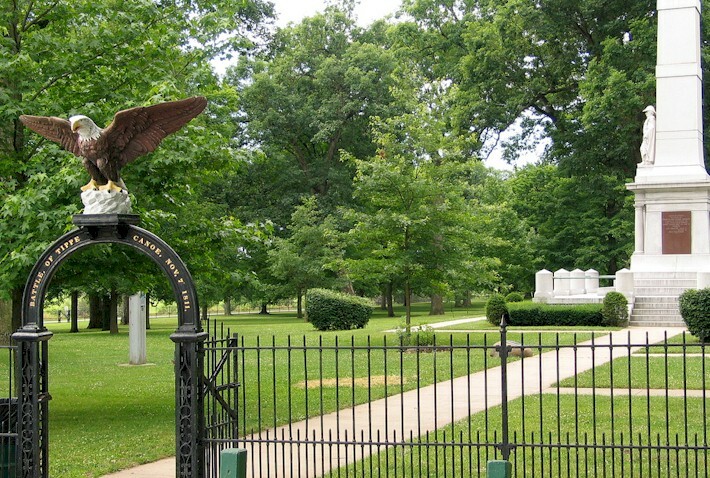 This was the Battle of Tippecanoe – taking place during the early morning hours of November 7, 1811. Casualties for the Americans included 63 killed and 126 wounded; estimated casualties for the Natives included 50 to 65 killed and between 70 and 80 wounded. After the battle, the Natives abandoned Prophetstown and Harrison’s men burned it to the ground, destroyed the Native’s food supply for the winter, and returned back to their base near present-day Vincennes, Indiana. Today, the battlefield site and monument can be seen on the left side of the train, just south of the Town of Battle Ground. About 25 years after the battle, the site became home to numerous political rallies – as William Henry Harrison successfully ran for President in 1840, with John Tyler as his vice-president. “Tippecanoe and Tyler, too” became one of the most famous campaign slogans in American politics. The battlefield became a popular site for tourists as early as the 1850’s, thanks in large part to its proximity to the railroad line we are traveling on today. The 85-foot-high marble obelisk, seen on the left, was built in 1908 for the cost of $24,500. 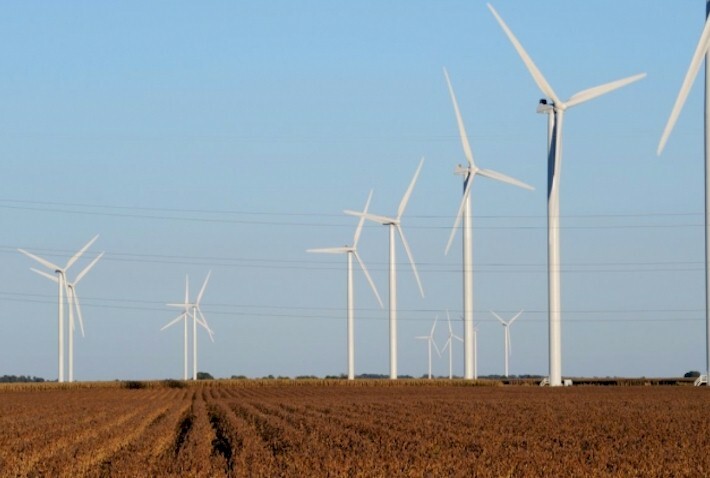 Between Brookston and Chalmers, those traveling on the Hoosier State should keep an eye out in the distance (especially on the left side of the train) for turbines that are part of the Meadow Lake Wind Farm. Wind turbines consist of three main parts: the tower, the blade and the nacelle. Most of the action takes place inside the nacelle, where the motion of the wind turning the blades is converted into electricity. The blades are attached to a shaft that runs into a gearbox. The gearbox steps up the speed of rotation, which then turns the generator producing electricity. Electricity must be produced at just the right frequency and voltage to be compatible with the utility grid. Less than one mile north of Reynolds, the train passes a large pellet plant off on the right; it’s owned by a company called Magnetation. Workers in Northern Minnesota use magnetic separators to recover valuable iron-bearing tailings out of waste piles that were left over from previous iron mining operations decades ago. 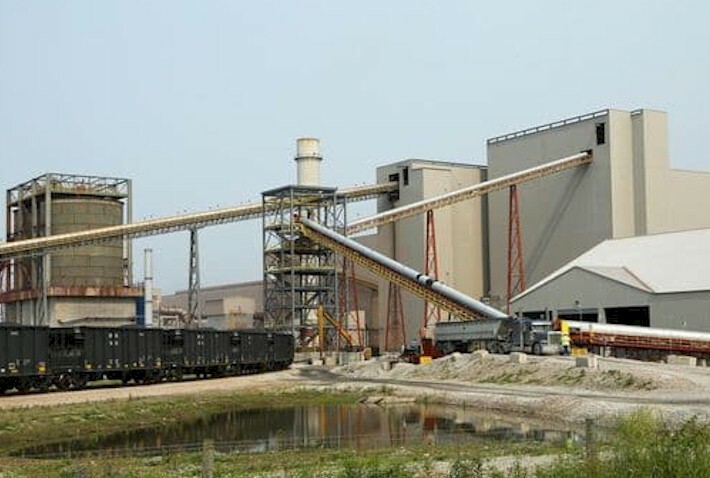 The iron ore concentrate is then shipped by rail to various customers, and the company’s own pellet plant outside of Reynolds, Indiana. The facility, which began operations in 2014, takes the iron ore concentrate and produces high quality fluxed iron ore pellets, a critical raw material for making steel. These pellets are then shipped down to Middletown, Ohio and Ashland, Kentucky, and serve as feedstock for AK Steel’s blast furnace operations. The plant you see from the train produces around three million tons of iron ore pellets annually. The company is going through bankruptcy, as there is declining demand for steel and oversupply. Railfans might also be intrigued by the rail system in place here at the pellet plant. The extensive infrastructure includes a six-layer loop and over 64,000 feet of track. The plant is service by trains both on the CSX line that our train is operating on, and the Toledo, Peoria & Western railroad line. Magnetation uses trains to bring in raw materials from the Iron Range area of Northern Minnesota – and exports the pellets as far away at the Gulf of Mexico. The last town in White County that northbound passengers will travel through is the Town of Monon. It was laid out in 1853 by James Brooks, President of the New Albany and Salem Railroad (forerunner of the Monon Railroad). 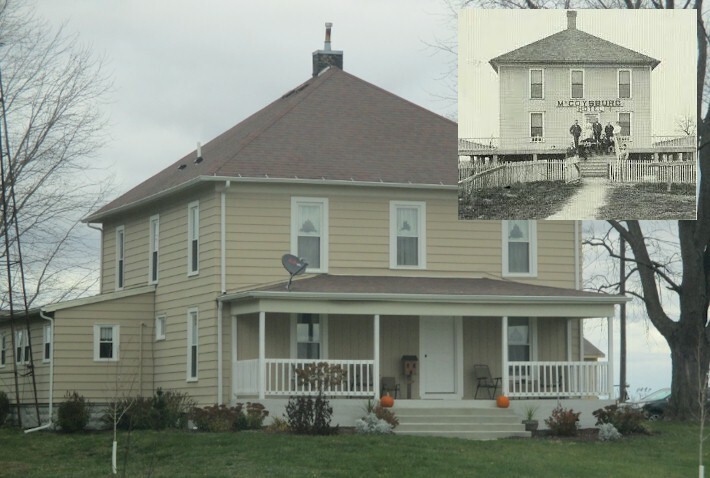 The town was originally called New Bradford, but that was changed to Monon by the time it was incorporated in 1878. The town’s name is derived from the name of two nearby creeks – the Big Monon and the Little Monon. The spelling of the names of the creeks was formerly ‘Monong’, a Potawatomi word which some believe meant “swift running”. Monon has a distinct railroad connection. 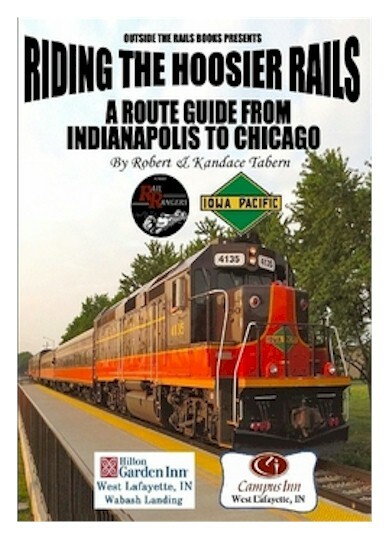 You may have noticed this route guidebook has mentioned that the Hoosier State travels on the ex-Monon Railroad route since Crawfordsville – or that the line from Lafayette to Munster is now part of the CSX’s Monon Subdivision. The Chicago, Indianapolis, and Louisville Railway (CI&L) was the formal name of the railroad that operated this route from 1897- 1956. Beginning in the 1940’s, company officials adopted ‘the Monon’ as a nickname in advertising. It stuck so well that the CI&L formally adopted Monon as its corporate title in January 1956. The Monon name became lost from the sides of railroad cars when it merged with the Louisville and Nashville Railroad on July 13, 1971. Of course, the L&N later was merged into CSX, whose tracks we are operating on today. So how you may be asking – of all of the larger cities along its routes – how did Monon, a town of less than 2,000 people get chosen for the name of this railroad? The answer lies in the fact that Monon was the junction point between the railroad’s two major lines – one that ran from Michigan City to Louisville, and the other than ran from Chicago to Indianapolis. 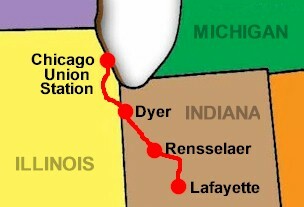 By looking at the map on the previous page, you see that from Crawfordsville to Monon, the Hoosier State has actually been running on the Monon’s former main line from Michigan City to Louisville, Kentucky. Here in Monon, we switch onto the Monon’s former main line from Chicago to Indianapolis. That is why our train will seem to make a sharp turn to the left, while appearing to switch between rail lines. Our train continues to follow what is now the CSX’s Monon Subdivision, but our direction changes from due north to more northwesterly. Unfortunately, portions of the Monon’s original two main lines routes have been removed from service now. If your train were to keep going due north in Monon, you would have ended up in Michigan City. Today, you can go north for only another 15 miles to Medaryville, where the track dead ends at a grain elevator. Likewise, if you turned right at Monon Junction instead of left, like our train does, you would have ended up taking the Monon’s Route into Indianapolis. Today, you can only go less than 10 more miles on this rail line down to Monticello – where it will dead end at the TP&W line that we crossed back at Reynolds. One of the few surviving Monon depots still visible from the Hoosier State route can be seen here in town. Look towards the right, as the train is going around the curve. The brick station, which can be seen from the train, opened in June 1953; it is currently used as a CSX freight office. By looking right, you should also be able to see a red caboose that sits in a grassy area between the old main line that continued north to Michigan City and part of the railroad wye here. Even though this caboose is not authentic Monon, it is still worth a visit if you’re ever in town off the train. There is also a marker at this site that presents a history of the Monon Railroad. Also keep your eyes on the right for a view of the Monon water tower. If you look at the right side – you can see it smile. The border between White County and Jasper County also marks the point where our northbound train leaves the Eastern Time Zone and enters the Central Time Zone. This means you will need to set your watch back one hour so it will be correct upon reaching Chicago. Even as late as the 1880’s, most town in the United States had their own local time, generally based on “high noon”, or the time when the sun was at its highest point in the sky. As railroads began to shrink the travel time between cities from days or months to mere hours, these local times became a scheduling nightmare. 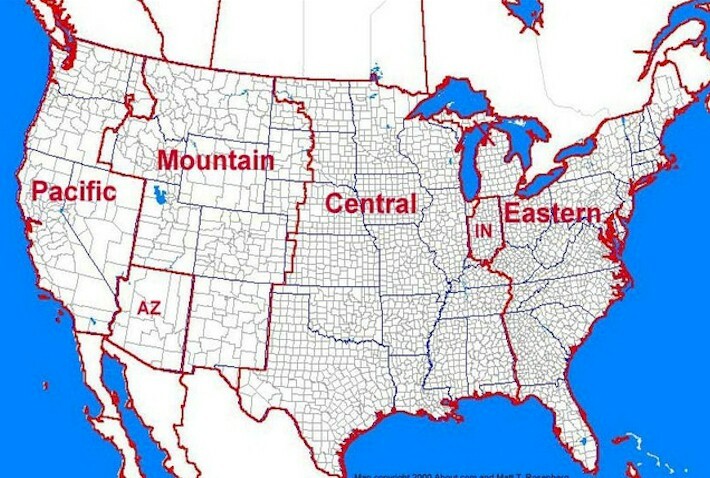 Instead of turning to the federal government to create a system of time zones, the powerful railroad companies took it upon themselves to divide the country into four times. Most Americans quickly embraced these new time zones, since railroads were often their lifeblood and main link with the rest of the world. It was not until 1918 that Congress officially adopted the railroad time zones. Because of Indiana’s geographic location at the center of the Midwest, there have been a lot of heated debates over the years as to whether the state should be on Eastern or Central Time. Residents who live in the eastern portion of the state generally preferred Eastern Time, as they had a strong connection with communities over the border in Ohio that also observe Eastern Time. Portions of the Cincinnati metropolitan area hang into Indiana, while some people who live in Ohio commute into Fort Wayne, Indiana for work. On the other hand, people who lived in the western portion of the state generally preferred Central Time, as they had a strong connection with communities across the border in Illinois, which observe Central Time. Many who live in Northwest Indiana and areas near Evansville commute to/from Illinois for work. Geographically speaking, Indiana should be completely within the Central Time Zone. In fact, the border between Eastern and Central Time should be 82�30’ minutes west longitude - or just west of Cleveland. But, the mapping of time zone boundaries isn’t exact and residents’ feelings have to be taken into consideration. A compromise was reached here in Indiana, with most of the state being assigned Eastern Time, except the far northwest counties around the Chicago area, and far southwest counties near Evansville. Even with that, some counties on the border have switched back and forth. When daylight saving time was proposed, another debate over clocks raged in Indiana. You likely know that daylight saving time is the practice of advancing clocks during summer months by one hour so that evening daylight lasts an hour longer, causing later sunrise times. Those in favor like an extra hour of daylight in the evening and say less electricity is used. Those opposed, particularly farmers, say their day is controlled by the sun and not the clock, and believe daylight saving hurts productivity because they are missing one extra hour of sunlight in the morning. Certain counties chose to observe daylight savings, while others did not. The debate came to an end in 2005, when the Indiana General Assembly voted to implement daylight saving time statewide. About two miles past the White-Jasper County Line, the Hoosier State travels through the unincorporated community of McCoysburg. This was once a thriving town. The Monon Railroad built a large stockyard with pens to handle 400-500 head of animals; it was located on the south side of the tracks. The depot sat across from the hotel and even had a telegraph and express office. The depot burned down in 1932. The Post Office was located inside of the grocery stores south of the mainline; it burned down twice, ignited by sparks from passing trains. The town also boasted an elevator, east of the business district. Electricity for the town was supplied by Gifford Marrs, who owned a Delco generator plant located in his garage. The community boasted a total of two street lights. There isn’t much to see from the train today as we pass through this little rural community. Look to the right for a view of an old railroad hotel here - it's now a private residence. McCoysburg was where the Chicago and Wabash Valley Railroad, built by Benjamin Gifford, met the Monon. This rail opened in 1898 and ran 24 miles from here to Dinwiddie; most of the service was grain trains. Gifford hoped to extend the tracks as far as Gary, but plans stopped upon his death in 1913. The Monon ended up operating this line until 1935. 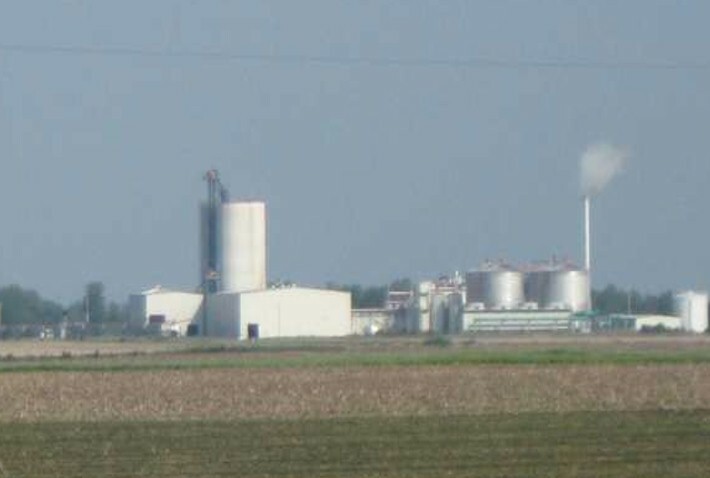 As the train passed between McCoysburg and Pleasant Ridge, keep your eyes out on the right side of the train for a view of Northwest Indiana’s first ethanol plant. The Iroquois Bio-Energy plant has the capacity to process about 14.3 million bushels of corn a year into 40 million gallons of fuel-grade ethanol. Area farmers supply much of the 35,000 bushels of corn per day that is digested, cooked and fermented to produce ethanol. The largest city in Jasper County is our next station stop – Rensselaer, Indiana. The community, then called Newton, was founded in 1839 at a point where there were some rapids in the Iroquois River. By 1844, it has been renamed Rensselaer for James Van Rensselaer, a merchant from Utica, New York, who came to the area after his business failed in the Panic of 1837. Rensselaer was home of the St. Joseph Indian Normal School from 1888 to 1896. This boarding school provided education of Catholic American Indian boys and tried to assimilate them into the white culture. The building now serves as a residence at Saint Joseph’s College, a private liberal arts college here in town. 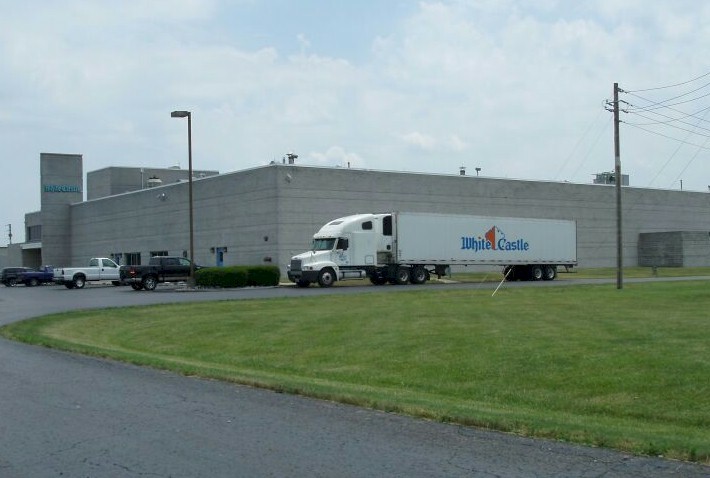 One of Rensselaer’s tastiest industries can also be seen from the route of the Hoosier State. Two buildings over from National Gypsum, still on the right side of the train, is the bakery where the buns are made and baked for White Castle. This restaurant chain, which is popular in Mid-Atlantic and Midwest states, features small, square hamburgers – known as “sliders”. The company was founded in Wichita, Kansas in 1921. Through the 1940’s, a “slider” only cost five cents each – and for many years after that they were priced at ten cents. The plant here in Rensselaer was featured on the hit CBS show “Undercover Boss” in 2010. Dave Rife, one of the company’s owners, showed up to pretend he was a new employee – he messed up a lot of the buns as he was trying to pack them. THE STORY CONTINUES FOR YOU... YOU JUST HAVE TO RIDE WITH US AND GET THE GUIDEBOOK! If you are interesting in hearing more stories like these, you have two options. First, come and ride with us on the Hoosier State train on Sunday, February 26, 2017. We will be doing a special presentation of the APRHF Rail Rangers: Riding the Hoosier Rails. 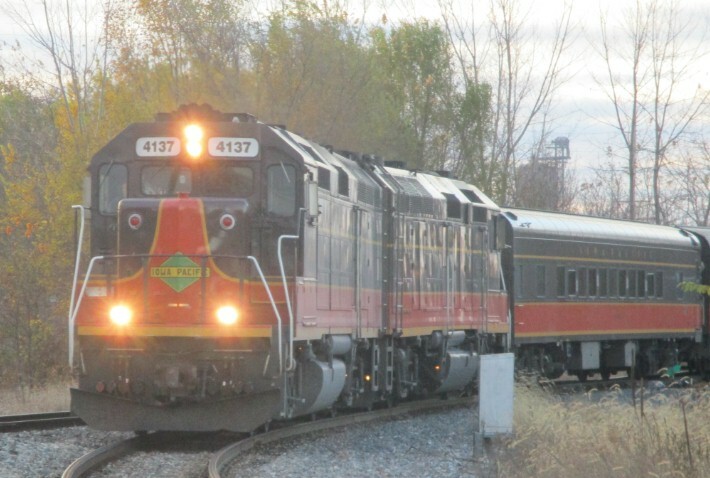 This will be the last program to be presented on Iowa Pacific's equipment, and possibly the last installment of our popular onboard educational series on this train route for quite sometime. You can hear our narration with both a coach or business class ticket, however we recommend a business class tickets so you get to have breakfast with us in the dome car. Second, purchase a limited edition copy of our 100+ page route guidebook. All money raised from the sales of this book goes to the APRHF Rail Rangers program. The best place to purchase your book is at http://www.railbook.org.